Note: This guest post is written by Chrisley Ann Hinayas of Ramon Aboitiz Foundation. Her article details the notes and observations of Ms. Evelyn Nacario-Castro, executive director of the Eduardo Aboitiz Development Studies Center of the Ramon Aboitiz Foundation Inc. during the recent World Cities Summit 2012, and her realizations on how much planning Cebu needs to embarks on its urban development. Speakers for the keynote plenary “Trends and Opportunities―Urbanisation Forces in the Next 20 Years” during the World Cities Summit 2012 in Singapore last July 1-4 share insights on innovations and opportunities that are molding cities into sustainable centers of global networks, economic vitality, and talents pools. Realizing the need to create integrated urban solutions for a sustainable economy, government leaders, ministers, industry experts, businessmen, and economists from all over the world recently spent several days together in Singapore. From July 1 to 4, they gathered for the World Cities Summit (WCS) 2012—the third since 2008—to discuss how to address the challenges of cities with growing economies, including protecting the environment while giving quality of life to their residents. Evelyn Nacario-Castro, executive director of the Eduardo Aboitiz Development Studies Center (EADSC) of the Ramon Aboitiz Foundation Inc. (RAFI) attended the summit, joined in 12 sessions, and listened to 64 different resource persons. “The summit was a venue to form new business partnerships and collaborations with other cities. It explored innovative and cost-effective solutions to the challenges of rapid urbanization among cities. Out of their policies and programs, cities could get an idea on how to respond to their own challenges,” Castro said. WCS is an exclusive platform for government leaders and experts to address liveable and sustainable city challenges by sharing integrated solutions and build new partnerships. This year’s theme is “Liveable and Sustainable Cities—Integrated Urban Solutions”. 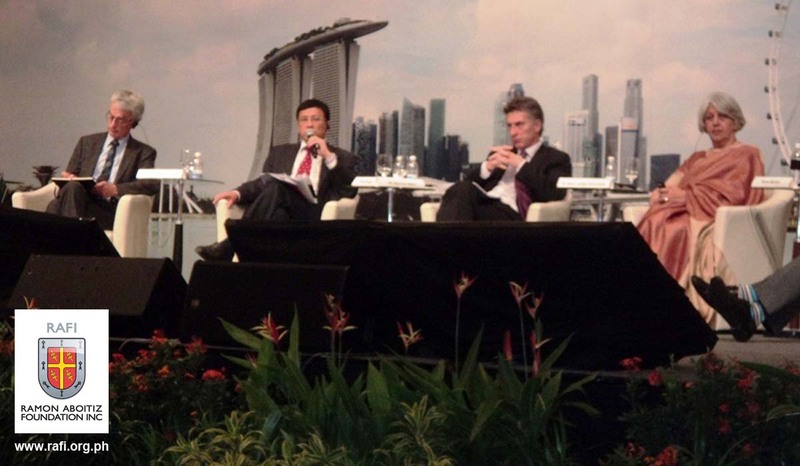 As a country constantly in transformation, Singapore was considered the ideal host for the summit. Castro noted that Singapore is a small city-state country or roughly two-thirds of Cebu but because of how the country was able to strategically plan ahead, it has transformed well its urban landscape to become one of the most livable cities in Asia. Singapore, through its national land use planning and conservation authority, the Urban Redevelopment Authority (URA), started its careful land use planning and good urban design in the 70s. It adopted a long term strategic planning approach to ensure sustainability in its physical development. “From the start, the leaders already knew what they wanted to happen in the whole city-state. Their plans included creating spaces for industries, green spaces, and residential areas, which we could see now in Singapore,” Castro observed. She added that cities, in general, are “locomotives of a nation”, saying that “competitive cities make a competitive country”. As focal point for and centers of opportunities as well as magnets for people to live in, cities must recognize that sustainable development is a local issue and urbanization must be by design and not by default. “We must plan, plan, plan, leaving room for expansion with outlook towards the future. The future of humanity is in cities; therefore, we must build and invest for the long-term. Long-term investments have long-term consequences,” Castro shared her learning. Sessions during the summit, featuring prominent speakers, also presented “universal” challenges of cities, such as urbanization and land use change, environment and climate change, growth in population, and over-stressed systems and over-loading of facilities, among others. “Every city experiences what we are experiencing. It is a matter of how we respond to these challenges. These cities survived these challenges by playing their individual roles. City leaders should act as negotiators, collaborators, enablers, and integrators,” Castro pointed out. City leaders shared similar responses, saying that leaders, to ensure competitiveness of cities, must plan and regulate development while finding, creating, and driving solutions that look beyond infrastructure. “Benchmarking with other cities is also important. Their experiences serve as think tank and repository of information, which we can use for strategic and integrated planning for our own cities,” Castro said. During the summit, New York City was awarded the Lee Kuan Yew World City Prize. The prize recognizes those responsible for initiatives that display good governance and innovations in tackling the many urban challenges faced by cities to create vibrant, liveable and sustainable urban communities. New York City was greatly affected after the 2001 World Trade Center bombing. Within a decade, it injected innovations to bring back the life of the city. One of these innovations is the complete change of streets. Castro learned from New York City that streets are for multiple modes of transport. “Streets are not just for cars. In smart growth, streets are not widened, rather spaces are optimized where people can walk, bike, and have open spaces. Good urban designing and planning have a big impact on public safety,” she noted. 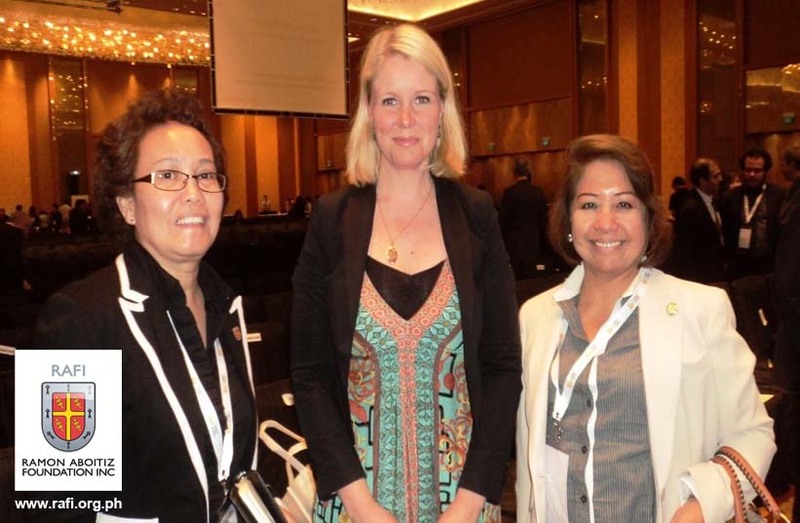 (left to right) Evelyn Nacario-Castro, executive director of RAFI’s Eduardo Aboitiz Development Studies Center (EADSC), joins Copenhagen Mayor Pia Allerslev and Consolacion, Cebu Mayor Teresa Alegado during the World Cities Summit 2012 in Singapore last July 1-4. Nacario said that a change in mindset is the first step. Three things that should be kept in mind, she added, are the importance of a vision, planning, and a shift of new paradigm for development. “We must plan, plan and plan,” she asserted again. “How ready our leaders are in carrying out these plans is one of the things we should consider. Our leaders should revisit existing policies,” she said. Through the work of the Metro Cebu Development Coordinating Board (MCDCB) where RAFI anchors as the research, program and organizational development unit, the concept of smart growth has been introduced to leaders in Cebu to encourage comprehensive urban planning and development. The MCDCB is composed of leaders from the government, the private sector, and civil society that takes the lead in the implementation of the Mega Cebu Project, which envisions a city-region for Cebu wherein cities and municipalities collaborate with each other towards urban development, sustainability, and livability, while maintaining geopolitical integrity. Which Credit Card Company is better: HSBC or Metrobank? The post is quite interesting, kept me glued for sometime. However the topic is one which needs contribution from all of us, it is not the duty of any one individual, we all need to work towards it. Infact we must take inspiration from New York city and strive to work their way up to make our surroundings ‘liveable’. Living in a city has its own share of problems but those in charge of the duty to look after its problems must keep finding ways to get rid of the problems. For instance, the New York City disaster was a very big issue, after this destruction on such a large scale it was pretty difficult for them to settle down all over again, but as we can see they have done it in a time period of 10 years, we all should take it as a lesson. A summit of this kind is very much needed today, as we all are aware of the condition of living in cities. I think these summits discuss about the feasible outcome of a problem faced by a city but the plans are never implemented, so we must take active part in these summits to be aware of the discussed results and also to make sure that these get implemented. I think every country must participate in summits like this, at least for the sake of facing the world cities every city or nation would work hard to overcome the issues faced by the place. A city is not only a good place to live, it has to be taken care of too. And I believe if the government makes laws for citizens to contribute towards the issues, problems will become easier to solve.